We traveled a long time on our ship until we reached Selasia, at the Spine of Taladas. The first people we have met there were the tree folk, Bolandi. What can we say about this strange high ogre race? I believe this short story they told us about themselves summarize their culture. Once upon a time the Greater Gods gathered at Celestial Palace in order to decide how to tackle with a new threat, the legendary monster called MoonShadow. The moonshadow was destroying everything in its pass and now our beloved 3 moons where the next target. Unable to win the beast, Gods asked their heroes to help them. The legendary heroes answered the call but they were unable to eliminate the threat. Eventually God’s last resort was a Great Bolandi hero, Fielax. 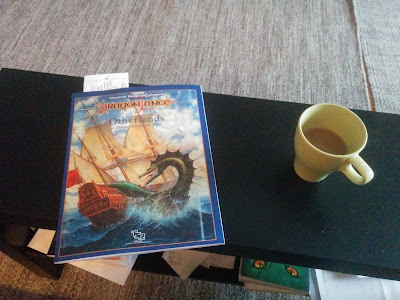 Recently I have finished reading DLR1 Otherlands for the Dragonlance Campaign Setting (Ad&d 2nd edition). Thanks to the new digital age, classic books can be reprinted and become available for anyone. So what is so special about Otherlands? To be honest nothing is special or crucial and it will most of the time fall out of notice from most DMs. But what it is worth of? The answer is that it belongs to a line of accessories that are easily read, like a short fiction stories. And here lies the true value of the Otherlands. It feels like a 19th century travel memoirs. From the 1st page till the end you can easily travel far away from the known world of Ansalon.